Home » Topics » Colds: When Should You Call Your Doctor? Colds: When Should You Call Your Doctor? • Most colds are not serious and only last seven to ten days. • There is no cure for the cold. Antibiotics only work on bacteria, not viruses. But there are many things you can do to relieve the symptoms. • If your child is younger than three months old, be sure to call the doctor at any sign of illness. In little babies, colds can quickly become more serious and need to be closely monitored. When your child is sick, it is hard to know if you should call the doctor or not. Is it just a cold or is it something more serious? The following guide should help take some of the guesswork out of it. But keep in mind; a parent’s intuition is priceless. If you are worried about your child, give us a call. We can help you decide if you need to visit the doctor or if there are some things you can do at home to make your child feel better. It is called the common cold for a reason—everybody gets it. 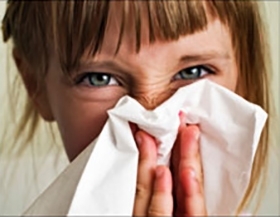 Kids are especially susceptible to colds. It is estimated that most kids get eight to ten colds before they turn two. Children in childcare or who have older siblings may get even more colds. Colds spread easily among children because they are not as careful about washing their hands, covering their mouths, and keeping their fingers out of their noses. Although the symptoms aren’t fun, most colds aren’t serious and don’t require a visit to the doctor. Typically the symptoms only last seven to ten days. Unfortunately there is no cure for the cold. Antibiotics only work against bacterial infections, not against viruses. However, there are things you can do to help relieve the symptoms and speed up recovery. • Drink lots of liquids. • Single-ingredient acetaminophen or ibuprofen can be used to help with fevers. Ibuprofen should only be used in children over six months old. Do not use ibuprofen if your child is dehydrated or vomiting. Carefully follow the instructions on the label and check with your doctor if you have questions about dosages. See our dosage chart. • Over-the-counter cough and cold medicines can be used for children six years old and older. Studies have shown that they typically don’t work in children who are younger and can have life-threatening side effects. Keep in mind that coughing is also one of your body’s defenses. It helps clear out the mucus from your respiratory track. • If your child is under six years old, try using saline drops and a rubber suction bulb. Cool-mist humidifiers are also a great way to help your child breath easier, especially at night. If your child is younger than three months old, be sure to call the doctor at any sign of illness. In little babies, colds can quickly become more serious and need to be closely monitored. If you have a young baby, be sure to keep him away from people who are sick. • Earache or ear discharge. • Difficulty breathing or rapid breathing. • Temperature is over 102° F.
• A fever that lasts over 3 days. • A fever that goes away for 24 hours and then returns. • A sore throat that lasts over 5 days. • Nasal discharge that persists over 10 to fourteen days. • Coughing that persists over 3 weeks. • The lips or nails turn blue. • Excessive sleepiness or crankiness. • Pus on the tonsils. What Can I Do to Prevent the Cold? While there is no cure for the cold, you can prevent it. Teaching your family these tips can go a long way in reducing the chance of getting a cold. • Wash your hands with soap and water or use an alcohol-based hand cleaner. • If you get sick, avoid contact with others so as not to spread the cold or flu. • Try not to touch your eyes, nose, or mouth.